The Jewish Cemetery of Altona Königstrasse. Sephardic Sepulchral Culture of the 17th and 18th century between Europe and the Caribbean is part of the Tentative list of Germany in order to qualify for inclusion in the World Heritage List. When news broke that Hamburg, my home town, would submit the Jewish cemetery in Altona to the German tentative list, my initial reaction was "We have an old Jewish cemetery in Hamburg?!". While I am used to go to odd places off the beaten path as part of my WHS travels, I did not anticipate to find such a site a mere 20min bike ride from my apartment. At the time the cemetery was founded (1611), it was not in Hamburg, but in Altona, a separate town till 1938. Altona's rulers (since 1640 Denmark) were more liberal in religious matters than Hamburg. They allowed the Jews to bury their dead on Jewish grounds. Jews from both Hamburg and Altona were buried here. Nowadays, the cemetery is in the middle of the town and the fact that a mere 155 years ago you were actually in a different country can only be witnessed by small stones inlaid on the border. 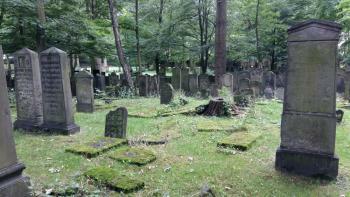 The cemetery suffered during the Nazi era by allied bombing and some vandalism. The Nazis did not, though, systematically destroy the cemetery. Supposedly because they intended to use the cemetery for racist research, the tombstones providing family trees and the graves providing DNA samples of 300 years of Jewish inhabitants of Hamburg and Altona. I took a long walk across the cemetery. You have to mind your steps quite a bit as the tomb stones are laid very close together. The site acts as a window into a distant past before the horrors of Nazi Germany destroyed the Jewish communities and history of Hamburg and Germany. The early tombstones from the 17th century are supposedly artistically valuable. The plan is to submit this as a transnational site of Sephardic Jews (Surinam). Personally, I would prefer a combined German submission on Jewish heritage in Germany (ShUM, Hamburg). I think there is a clear universal value here. Update: It seems the nomination was pulled due to the scope of the size being too limited. Germany is reviewing if this can be combined into a larger serial site. The cemetery can be reached by bus and train. Königstraße S-Bahn station and Altona Station are close by. Check out the opening hours before you go. It's open only three days a week for three hours (Tue, Thu, Sun 14-17h or 15-18h). There are also guided tours (Sun 12h). I would recommend Sunday as the cemetery is located between two roads with heavy traffic. Obviously, the Speicherstadt is nearby. If you have a little time you can actually walk along the Elbe across the Altona fish market to get there. Or take a trip with the harbor ferry. The history of Altona is quite interesting. If you are on the Schulterblatt (Schanzenviertel) you are standing on the border and you can find the border stones. A different, sadder kind of stones also found all over Hamburg are the Stolpersteine (Stumble Stones). They indicate where Jews lived or worked in Nazi Hamburg and what destiny awaited them.